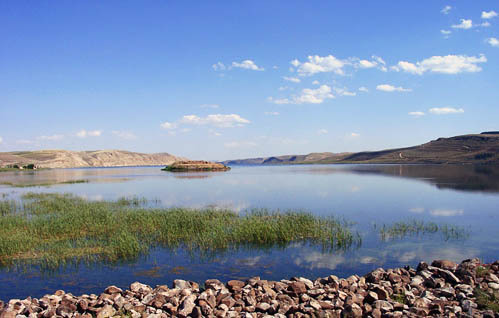 The photos we post of the Euphrates River are always popular. I suppose this is because of the historic events associated with the river, and because so few people have seen the river. The Euphrates begins in the mountains of eastern Turkey (ancient Urartu/Ararat), flows south through Syria and Iraq before ending at the Persian Gulf. Some of the great Bible characters are associated with the River, even when it is not named. We can be sure that Abraham crossed the Euphrates when he left Haran and headed south to Canaan (Genesis 11:32 – 12:1-9). I like the account of Jacob fleeing from Laban. This photo was made in northern Syria, northeast of Aleppo in 2002. Here the river is wide because of a series of dams built by the Syrians. This can not be far from the place where the biblical patriarchs crossed the river. The Euphrates River in northern Syria. Photo by Ferrell Jenkins. This entry was posted in Bible Places, Old Testament, Travel, Turkey and tagged Iraq, Syria. Bookmark the permalink.